With any luck, the first week of October will bring us beautiful, bikeable weather. Let’s take advantage of it! You can enroll your child now in our cycling camp for teens and pre-teens! 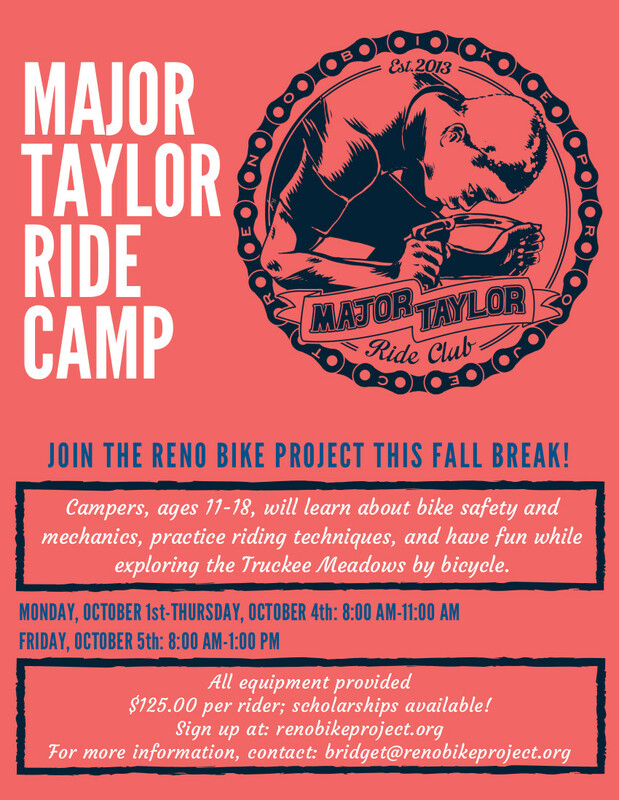 At our introductory Major Taylor Ride Camp, we learn road safety, bike handling, mechanics, and more skills; all while exploring the Truckee Meadows and doing fun activities on road and mountain bikes. 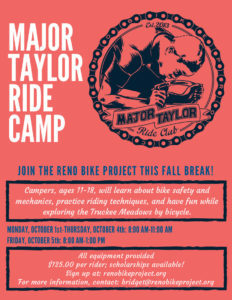 At only $125 per head, the Major Taylor Ride Camp is fun, physical, and affordable. Enroll for camp from October 1-5! We offer sliding scale pricing on our camp tuitions for families who need it. Making camp affordable for all is important to us, but our margins are already pretty minimal. Consider making a contribution to our Camp Scholarship Fund to support discounted tuition for families who need a little help! We look forward to riding with and getting to know your kiddo over break. Please send any questions to our Youth Programs Coordinator, Bridget.